Click on your state from the list below to determine what type of prescription paper to use. 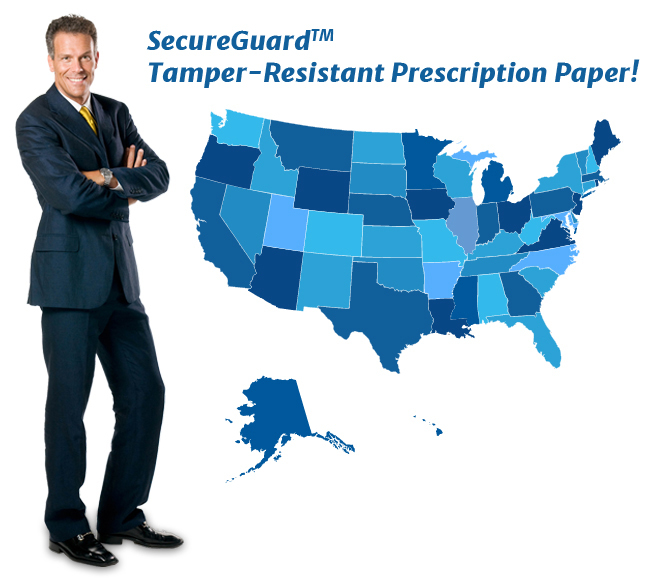 SecureGuardTM prescription papers offer 9 levels of security for your prescriptions! preprinted forms or valuable paper in your printers secure from theft. • Solutions to secure your laptop, notebook, projector or monitor. • Refrigerator locks for dormrooms, industrial kitchens or assisted living facilities. • Competitive prices on Medicaid- approved SecureGuardTM Laser Prescription Paper. Keeping our customers satisfied is important to growing our business. We personally answer all telephone inquiries.